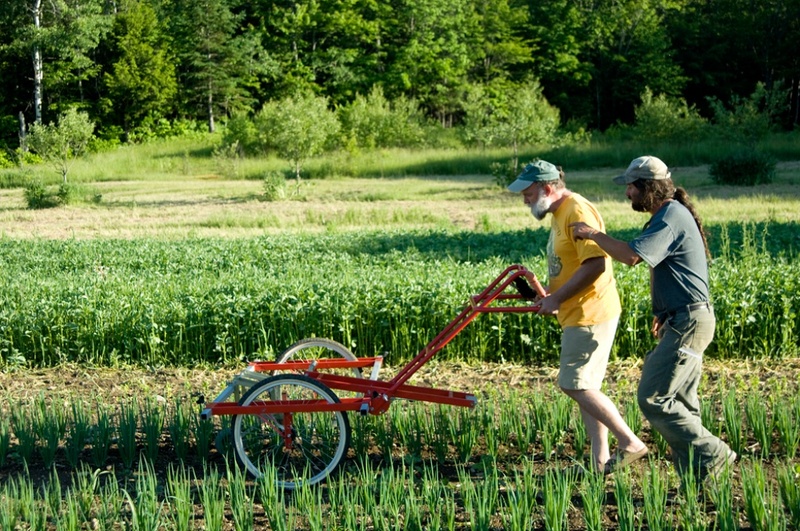 Small-scale farmers are in great need of scale-appropriate weed management tools. In this project we demonstrated and evaluated the Weed Master, an innovative set of cultivation and flame-weeding equipment, designed and built by a Finnish organic farmer. 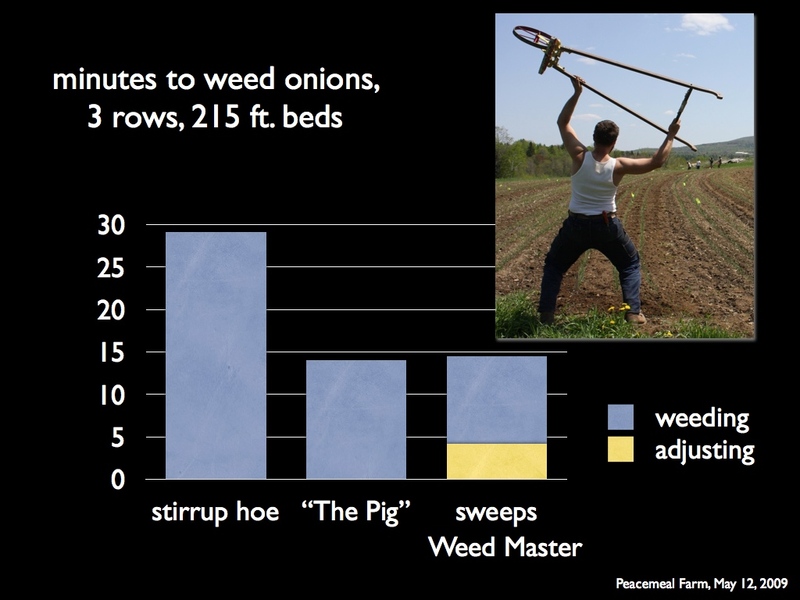 While the Weed Master tools did not offer an improvement in cultivation efficacy compared to conventional tools, it did offer a dramatic increase in working rates that could reduce weeding costs, or offer opportunities for additional weeding operations and thus greater cumulative efficacy. Through a research blog (gallandt.wordpress.com), YouTube videos (YouTube Channel: zeroseedrain), on-farm demonstrations, and grower meetings we reached approximately 1,000 individuals to inform them of these novel tools that could improve weed management on small- to mid-scale diversified organic vegetable farms. Farmer Clayton Carter demonstrates the Weed Master to MOFGA Apprentices. Photo Credit: Mike Mardosa, University of Maine Public Relations. During the PI’s recent sabbatical in Denmark, he collaborated with Europe’s leading weed scientists in the area of physical and cultural weed management and was introduced to an innovative set of improvements to the old “wheel hoe” idea. The Weed Master has two wheels, a tool bar, and lightweight cultivator attachments, some of which have a parallel-linkage design. This collection of tools is the first transfer of physical weed control technologies, including sweeps, rolling disks and finger weeders, from the tractor tool bars of larger farms, to a hand tool appropriate for a farmer of 4 acres or less. Two notable features of this tool represent real innovation in this otherwise vintage implement. First, using two wheels and a scaled-down toolbar provides lateral stability and adjustment flexibility, e.g., to cultivate both sides of a crop row, that is possible with relatively few wheel hoe designs. Second, lightweight parallelograms offer precise depth control, and thus the opportunity to optimize soil movement (weed control) and draft or effort required to push the implement. Supported by a grant from the Maine Agriculture Center, in the fall of 2008 we purchased a Weed Master from Petri Leinonen of Elomestari Oy Ltd. of Kukkola, Finland (http://personal.inet.fi/yritys/elomestari/english/english.htm). In this NE SARE Partnership Project we demonstrated the equipment on three Maine farms. Farmer-evaluators used the equipment over a period of at least 2 weeks, and we shared their experiences with other growers through an online blog, videos, meeting presentations and demonstrations. The field evaluation of the equipment will be completed by late July. This target was reached. However, due to the extremely wet 2009 growing season, the quality of the farmers’ evaluation of the equipment was less than desired. As the project was designed to permit the growers two weeks to work with the tools, this was generally not sufficient time due to the hectic nature of the few field-working days that occurred in the early growing season. Video editing and initial drafting of the Fact Sheet will occur in Aug and September 2009. We did not produce a Fact Sheet, but rather established a research blog with Weed Master-tagged entries that will permit growers to learn of the on-farm trials of their peers (see: gallandt.wordpress.com). We exceeded my goal related to video production, especially in regards to the quality of our video documentaries. The excellent technical work of David Merrill made for very interesting and high quality production. The five videos related to this project can be viewed at our YouTube Channel: zeroseedrain. The equipment will be demonstrated the Ag-Demo area of the Common Ground Country Fair in September. We met this goal, although this venue turned out to be less successful than the MOFGA Apprentice demonstrations conducted at the Peacemeal Farm. The culmination of the project will be a special session on Scale-Appropriate Weed Control Tools at the Farmer to Farmer Conference in November, 2009. We met this goal, and had a very good turnout at the session (70 growers). The Weed Master was first delivered to the Peacemeal Farm in Dixmont, Maine. We conducted an initial, early-season trial flaming carrot, and returned to cultivation onions. The equipment stayed at Peacemeal for two weeks and then was demonstrated and delivered to the Fisher Farm in Winterport, and then the Fail Better Farm in Montville. At each site, we assembled the tools with the growers, gave them a chance to try the tools, and then did a comparison of their typical tools to the Weed Master. We conducted pre- and post-cultivation measurement of weed density in multiple quadrats to quantify efficacy of weed control. We also timed the weeding operations to quantify working rates. 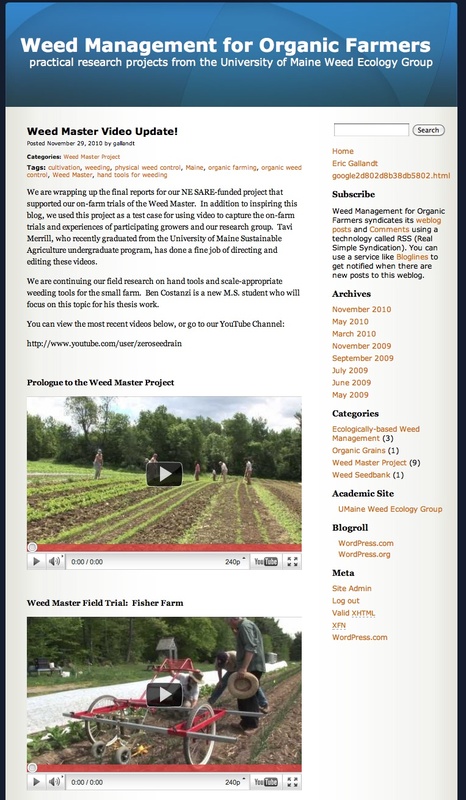 Video was recorded at each site, with interviews of the participating farmers to document their experience and thoughts on the performance of the tools. We completed on-farm demonstrations and farmer evaluations as planned. Demonstrations were held at field day events and the Common Ground Country Fair, and a special session featuring the Weed Master and participating farmers was held at the MOFGA Farmer to Farmer Conference. We maintained postings to the research blog, posted a video of the Peacemeal Farm evaluation, including a great segment with a “race” between the Weed Master and the farmer’s favorite tools, and we recently posted three final videos documenting experiences at Fisher and Fail Better Farms. 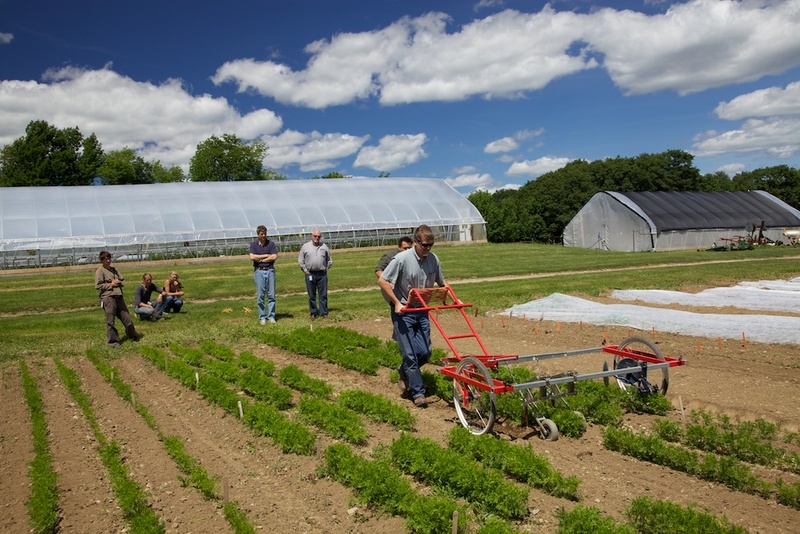 Our first on-farm trial was conducted at the Peacemeal Farm in Dixmont, Maine. Here we compared the Weed Master with sweeps to two of Mark Guzzie’s favorite weeding tools, a stirrup hoe (5 in. from Johnny’s Selected Seeds), and an old wheel hoe, the Red Pig, which is based on a much older Planet Jr. design. In this test participants weeded transplanted onion, 3 rows in 215 ft. long beds. Slowest was the stirrup hoe, at 29 minutes (Figure 1). The Pig and Weed Master came in at 14 and 14.5 minutes. The Weed Master required readjustment to move from the center to outside rows in this 3-row bed system; the net weeding time was 10 minutes. Thus, in one- or two-row beds, or larger areas where the adjusting time is depreciated over more area, the Weed Master offers a significant increase in working rate, approaching 30% in this case. To measure efficacy of weeding, weed density was measured before and after cultivation at several locations in each treatment. Initial weed densities varied among the treatments based on the random variation in the field (e.g., 33 per square ft. in the stirrup hoe plot compared to 205 per square ft. in the Pig treatment, Figure 2). Post-cultivation densities, however, ended up similar among the treatments (e.g., common letters indicate means that are not significantly different; Figure 2). The proportion of weeds controlled was greater, as expected, between the crop rows (average mortality was 87%) compared to within the crop rows (54%), but was similar among the different tools (Figure 3). 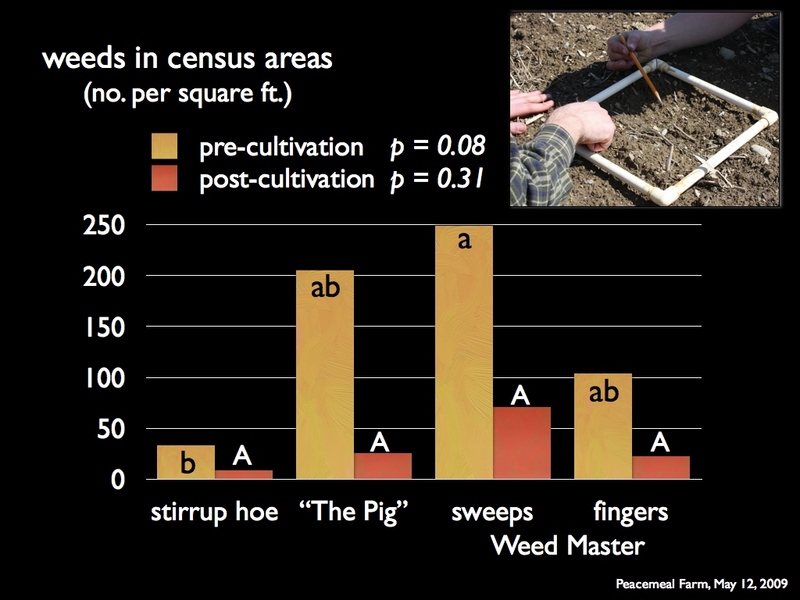 Thus, while the Weed Master offered greater working rate than the tools typically used for weeding at the Peacemeal Farm (Figure 1), efficacy was similar (Figure 3). In addition to on-farm trials, we conducted two experiments at the University of Maine Rogers Farm, using late-sown sweet corn, and condiment mustard sown as a surrogate weed. In these experiments, the Weed Master with sweeps, finger weeders and disk hillers was compared to the widely used Glaser Wheel Hoe, two long-handled hoes (colinear hoe and the stirrup hoe), a short-handled hoe, and hand weeding. Efficacy was similar among this wide range of tools in the first experiment, but lower for the Glaser wheel hoe and Weed Master implements in the second experiment (Figure 4). 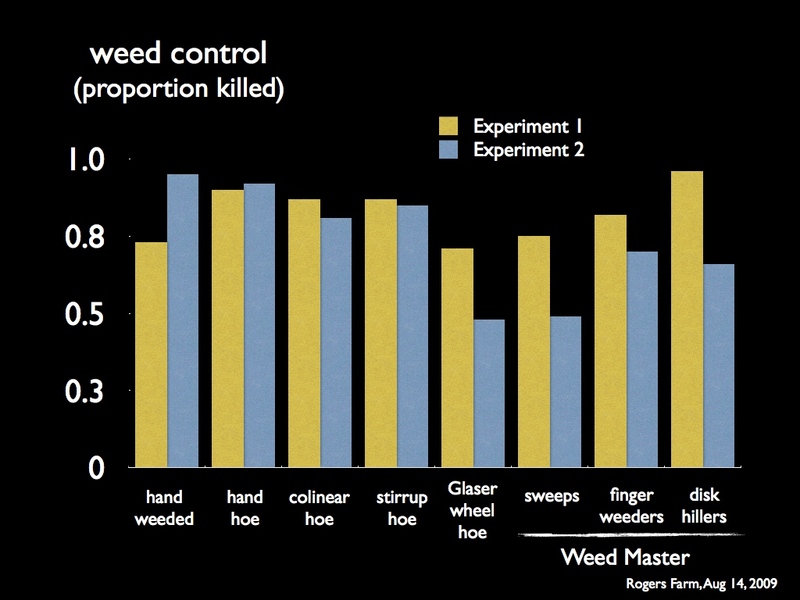 Variability in efficacy measurements was, as expected, lower for hand weeding and hand tools compared to the pushed tools, with the exception of the Weed Master disk hillers in the first experiment (Figure 5). Characterizing this variability, and understanding the underlying causes is the subject of current research. Our second on-farm trial was conducted at the Fisher Farm in Winterport, Maine. Here Beth Haines and Dennis Fisher compared the Weed Master with sweeps to colinear hoes. Weeding two rows of onions on 100 ft. beds took 12 min. with the colinear hoe, and 30 sec. with the Weed Master (an additional couple of minutes would be necessary to return to cultivate the inter-row weeds). 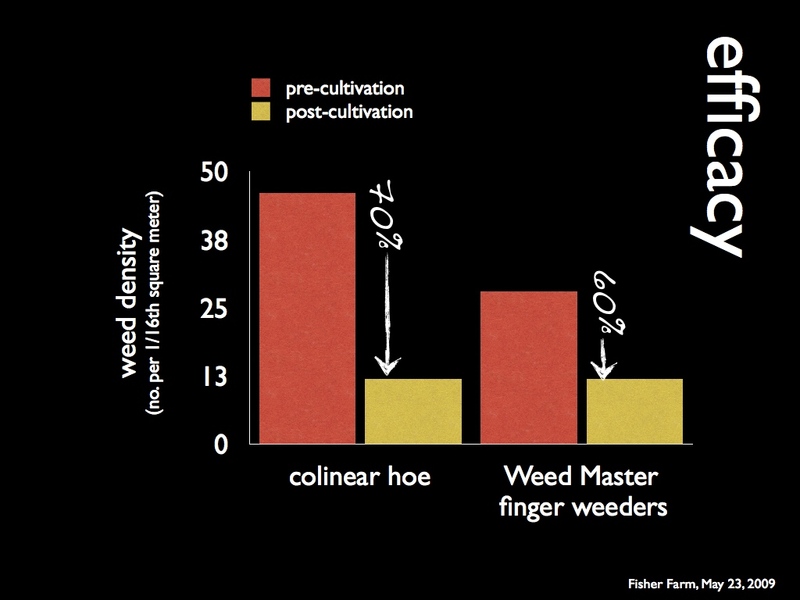 Despite this large difference in working rate, efficacy was similar, averaging 70% with the colinear hoes, compared to 60% with the Weed Master (Figure 6). Our final on-farm test was performed by Clayton Carter at the Fail Better Farm in Montville, Maine. Weed density here was relatively low, (e.g., less than 6 per square ft., Figure 7). Here Clayton compared the Weed Master to his old Planet Jr. wheel hoe; working rates were similar for the two tools (averaging 5 min. each). In this case, improved efficiency with the wheel hoe was due to the 4-row bed system in which the 8-inch scuffle attachment of the wheel how fit perfectly between the rows. Working rate of the Weed Master compared to other hand tools. 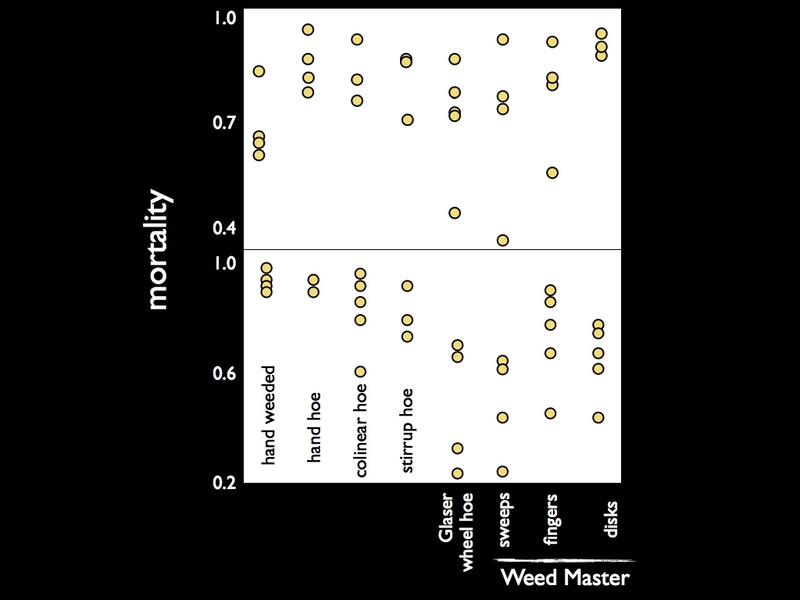 Efficacy of the Weed Master compared to other hand tools. 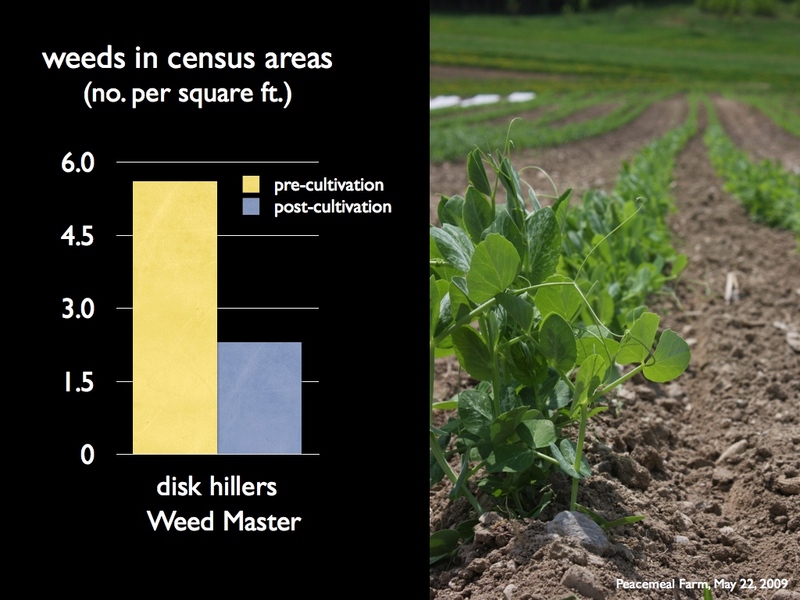 Weed density before and after cultivation with the Weed Master sweeps and disk hillers (Fail Better Farm). Within and between treatment variation in cultivation efficacy in two trials conducted at the University of Maine Rogers Farm. Weed control in onion at the Fisher Farm using colinear hoes vs. the Weed Master Finger Weeders. Efficacy of weed control of Peacemeal Farm’s typical tools compared to the Weed Master. 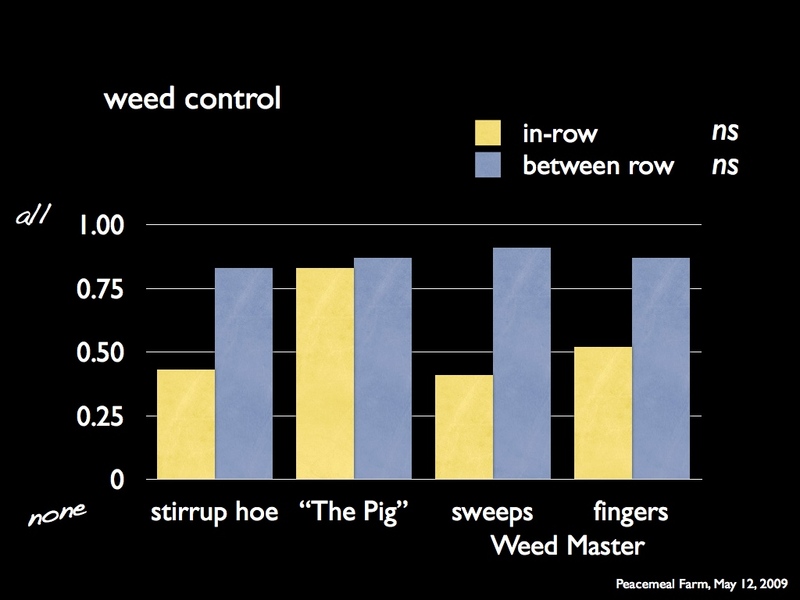 Within (intra-) and between (inter-row) efficacy of Peacemeal Farm’s typical tools compared to the Weed Master. Through on-farm trials, field day talks, and winter meetings we introduced these novel tools to 445 individuals, including many farmers and their apprentices. We used, for the first time, a research blog to post information about the project in a timely manner, and to allow new audience members to review past as well as current experiences (see: gallandt.wordpress.com). Since the May 2009 launch, the blog has had 5,800 visitors, with an average of 12 per day in 2010. It has been quite satisfying to see large spikes in activity following our field presentations or grower meetings. In new initiative we used video documentary to record our on-farm activities and posted these to our new YouTube Channel: zeroseedrain. Two videos posted in the summer of 2009 have had a total of 780 views as of December 2010. Three additional videos, posted in November 2010, have had 110 views in a little over one month. May 19, 2009. Pre-emergence Flaming Carrot. Peacemeal Farm, Dixmont, ME (1 in attendance). May 23, 2009. Disk Hilling Peas. Peacemeal Farm, Dixmont, ME (4 in attendance). May 23, 2009. Finger-weeding Onions. Fisher Farm, Winterport, ME (3 in attendance). June 2-3, 2009. 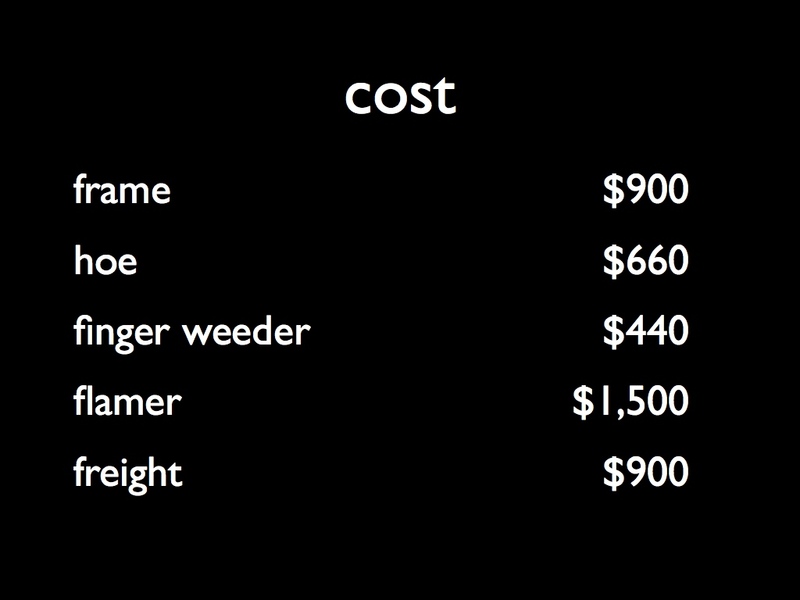 Weed Master Implements vs. Grower’s Tools. Fail Better Farm, Montville, ME (6 in attendance). June 22, 2009. Demonstration of Weed Master Tools to MOFGA Apprentices and Journey Persons. Peacemeal Farm, Dixmont, ME (85 in attendance). July 7, 2009. Grower Evaluation of Weed Master Implements. Wolf Pine Farm, Alfred, ME (4 in attendance). July 7, 2009. Presentation and Discussion of Weed Master Tools to York County Grower Group. Wild Root Farm, Kennebunk, ME (18 in attendance). July 27, 2009. Demonstration and Hands-on Testing of Weed Master Tools. University of Maine Sustainable Agriculture Field Day. Rogers Farm, Stillwater, ME (45 in attendance). September 26, 2009. Demonstration of Weed Master Tools at MOFGA Common Ground Country Fair. Unity, ME (25 in attendance). October 2, 2009. University of Maine Weed Ecology and Management Students Test the Weed Master Implements. Rogers Farm, Stillwater, ME (15 in attendance). November 8, 2009. Fighting Weeds on a Small Scale, Presentation at the Maine Organic Farmers and Gardeners 2009 Farmer to Farmer Conference. Northport, ME (70 in attendance). June 23, 2010. Weed Identification, Biology and Control with Hand Tools. Maine Organic Farmers and Gardeners Association Summer Apprentice and Journeyperson Summer Meeting. 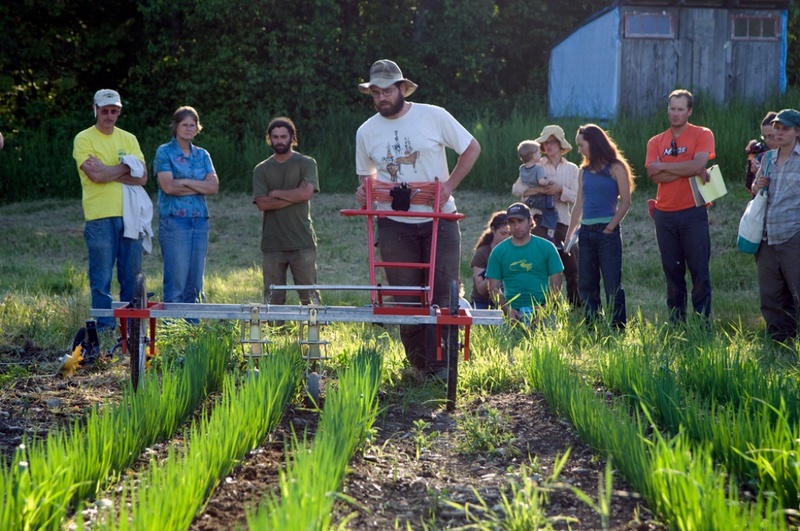 Peacemeal Farm, Dixmont, ME (90 in attendance). July 1, 2010. The Weed Master and Innovative Hand Tools for the Small-scale Grower. University of Maine Sustainable Agriculture Field Day. Rogers Farm, Stillwater, ME (65 in attendance). August 2, 2010. Demonstration of the Weed Master. Four Season Farm, Eliot Coleman and Barbara Damrosch; Adam Lemieux, Johnny’s Selected Seeds. Four Season Farm, Harborside, ME (2 in attendance). Demonstrating the Weed Master at Johnny’s Selected Seeds Trial Garden. Research blog which reported on the Weed Master project. Although we did not perform a formal cost/benefit analysis of this equipment, partial budgeting of the Weed Master compared to a collinear hoe shows a large cost savings. For a 300 square foot bed, the collinear hoe weeding cost is estimated to be $2.30, compared to approximately $0.30 for the Weed Master tools. Although the initial cost for the equipment seems high ($5,190, including the frame, goosefoot hoe, finger weeder, rolling disk hoe, broadcast flamer and row flamer, and freight from Finland), weeding on many farms requires many hours of hand weeding and high labor costs. Wheel hoes, by comparison, cost as little as $350 (e.g., Glaser Wheel Hoe), and likewise offer a large increase in working rate, for comparatively much lower investment. Further optimization of the Weed Master to planting arrangements would likely offer greater efficiency and advantage over wheel hoes, but additional work is required to address this. The improved working rates possible with the Weed Master could dramatically reduce costs of weeding on farms with moderate to low weed pressure. Where weed pressure is high, and hand weeding costs are commensurate, the greater working rate would leave time for additional passes with the equipment and thus higher levels of weed control prior to hand weeding. The general plan for this project worked well, but there is room for improvement. It was clear from spending time with growers that two weeks was not sufficient to trial the equipment and offer them a level of experience that they would need to make concrete recommendations to their peers. However, it would be not be sufficient to simply demonstrate the tools and leave them for the summer. In future related studies my aim would be to pay part of the salary of one farm employee who would be responsible for conducting comparative trials. By engaging a farm member in the evaluation more formally, I think there is a better change of more fully engaging the farmer/manager.